The Royal Adelaide Golf Club was formed in 1892 and has been based at the western suburb of Seaton since 1905, less than 20 minutes from Adelaide’s town centre and less than 2 kilometres from the coast. Although the present day course occupies the same land as the course that was first called Royal Adelaide, only eight of the modern day holes bear close resemblance to that layout. ‘Cargie’ Rymill and Club Secretary C.L. Gardiner laid out the first rudimentary course in 1905. An article on Dan Soutar by John Scarth and Neil Crafter in Golf Architecture takes up the story: “In 1906 the Club went in search of a professional opinion on the layout for the definitive course. They selected newly turned professional Dan Soutar, with Club minutes recording that no member was to give any opinions on the course to Soutar except the Committee." “The Committee “decided not to adopt Soutar’s new course at present” and work started almost immediately on making bunkers on the Rymill layout. Interestingly, the new course made use of 14 of the greensites that were planned by Soutar." Alister MacKenzie made a four day visit to South Australia in the middle of his Melbourne based assignments in 1926. The club was keen to canvass his views as to a possible re-routing of the holes as the Grange to Adelaide tram line which bisected the property was due to be electrified. MacKenzie, always quick to ferment his ideas, proposed an immediate crossing of the railway line between locker room and first tee so that the 1st was played west of the railway on a piece of land that was to occupy the first 13 holes. The club demurred on strong protest from the membership so the 1st retained its historical position. MacKenzie was enthusiastic about the course’s potential, remarking that it offered “real links land, a delightful combination of sand dunes and fir trees, a most unusual combination, even at the best seaside courses” adding that, if his suggestions were acted upon, the resultant course would be “superior to most, if not all, English championship courses.” Rebuffed at the 1st, it is in the run of holes from the 3rd to the 8th that Mackenzie’s legacy is most clearly delineated. Somewhat analogous to the role played by the four hills that define the front nine of the West course at Royal Melbourne, MacKenzie’s plan made the most of the large sand dune positioned around the 3rd green. Although the sea hasn’t bordered the course at The Royal Adelaide for some 10,000 years, it remains, like Royal Lytham & St Annes, more of a links course than an inland course. 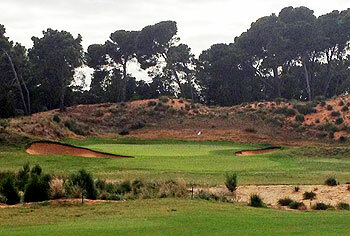 Royal Adelaide is a favourite golf course of many Australian golfers and it’s easy to see why. Part of the above passage is a brief edited extract from The Finest Golf Courses of Asia and Australasia by James Spence. Reproduced with kind permission. Local Cargie Rymill was the man who initially was responsible for the laying out of the course which became 'Royal' in 1923. In 1926 Dr Alister MacKenzie also contributed some suggestions, some of which were incorporated into the course. The combined efforts of these two gentlemen has produced a golfing gem that has endured through the ages. It is only in recent years that the club employed Michael Clayton to renovate the course, and opinion is divided on the merits of his efforts. Clayton is known for his obsession with the removal of trees, and at Royal Adelaide he has had a marked affect, changing the entire look of the golfing landscape. In my opinion part of the beauty of Royal Adelaide was lost when all the fairways were opened up. One can now look across parallel fairways at one, two, six and eight as one does on a Scottish playing field – and this is quite an adjustment for those who were fond of the tree-lined look of old. Nevertheless these are quality holes, and turf conditions probably benefit from the current environment. Clayton has 'tidied up' a number of holes, generally to the good, but lost the confidence of the members when completely redesigning the 17th hole (based on an old MacKenzie concept). The look and feel of the new hole was so alien to the rest of the course, and the club eventually sought assistance from Tom Doak to try and modify the look to match the rest of the course. Royal Adelaide remains a favourite course to play in Australia. It is a lovely place to spend a day absorbing the history and feel of the place – after all RAGC has hosted 9 Australian Opens to date. But the first time visitor would be excused for questioning all of that on initial impressions. The land is predominantly flat. The entrance road crosses the final hole, a busy railway line runs right through the centre of the property. Then you approach the first hole by walking beside the railway line, and around the 18th green to a flat hole that doglegs around a low mound, and borders the driving range. Sadly the finish is weak. After a blind tee shot on the par 5 15th hole, all interest dissipates as the rest of the hole is absolutely dead flat . The mid length par 3 16th hole has good 'bones' but lacks 'presence', the aforementioned 17th hole looks and plays like a course from Mars compared to the rest of the course. The final hole is a flat, straight, mid length par 4 hole that crosses the entrance road to a 'ho hum' green site surrounded by clubhouse, railway line, first tee, and driving range. It is a slightly disappointing way to finish a wonderful old course. Perhaps my critique is too harsh... the best of Royal Adelaide is uplifting – and I would play there any time I got the opportunity. Whatever you do, make sure you get the opportunity to make up your own mind! You know, I’ve always looked at pictures of Australian sand-based inland courses, such as those on Melbourne’s sand belt, and this place, and thought that whilst they look pretty classy, it was missing any sort of wow factor, visually anyway. I was not feeling terribly drawn to them from the photos, but knew that all those enthusiastic advocates couldn’t all be wrong. Now I’ve played one – I totally get it. It’s all about the gameplay – it’s a completely different playing experience to most parkland courses. You’re just looking at the terrain in front of you and realising you’re going to have to do it differently, and you soon realise that this version of golf is simply more fun. The playing surfaces are so quick and firm - you have to conjure up so much more imagination when selecting your shots, playing the contours, visualising how it rolls out. The first thing that struck me about Royal Adelaide was the conditioning – it was absolutely immaculate (aside from the purposefully rustic areas away from the playing surfaces, of course). The greens were some of the truest I’d played in years. Not only that, I felt that the set-up was pretty much perfect, e.g. matching green speeds to the degree of contouring on the greens, mowing lines that were acutely attuned to the accentuation of gameplay, and tightly mown fairways around the greens to always give that Texas wedge option. Copious amounts of kudos to the greenkeeper / superintendent / whatever you call them in your country – he’s a master of his craft. But a few holes in, and you realise that the whole course is a masterful lesson in understatement. Whilst on first glance it all looks a bit pedestrian and conservative, in fact pretty much every single hole has one or two little features that completely set the tone for strategy and game play, and elevates it immensely. The bunkering and green tilt on 2, the movement of the land throughout 4, the fairway bunkering on 5, the green angle on 8 – I could go on. Such variety makes me itch to play it again. And again. And again. And it left me thinking – is this the perfect way to create a course that suits all ability levels? Nothing too heroic for the high handicappers, but never easy for the scratch player to put a low score together. Simply put – IT MAKES YOU THINK. Favourite holes – everyone says 3, and for good reason. Never seen anything like it. 4, 6, the lone moment of penal heroism at 7 (certainly in the wind we played it in! ), 10 and 11 stand out for me. Whilst there is some slight flickering of the flame across the final six holes, it was still great golf, with some of the open spaces reminding me somewhat of Hankley Common. I probably didn’t experience the course as it should be played to be honest, as the wind was rarely below a five club wind, and if we measure how many clubs the wind is by how many multiples of 10 metres / yards it takes off your shot, it got up to a ten club wind on occasion, and balls were moving on greens. They have suspended play at major championships for less. Still loved it though. Not only do I want to play it again, the urge to get to Melbourne has ratcheted up a number of levels. Now when I look at those photos of the sandbelt, I’m starting to understand what I’m looking at. After a week of island hopping including Tasmania and King Island I was back on the mainland and off to see the recently restored Royal Adelaide. Royal Adelaide had fallen from the glory of the World Top 100 according to Golf Magazine, however this was pre restoration and with Doak and his Renaissance Golf crew thoughtfully bringing back all the wonderful nuances of Alister MacKenzie my anticipation of this first visit was very high. Fortunately, I was treated to a perfect day and the course was in impeccable shape given the next week the LPGA event was to be hosted there. I can’t say much more than the fact that I simply loved the course. It deserves far more than a single play and far more is necessary to understand and utilize all the strategy necessary to play ones hcp on this great course. My favorite holes were; the short par 4, 4th hole, with the semi-blind tee shot up over a hill to a great little green ticked into the corner of some dunes, the bunker surrounded par 3 7th hole and the short par 4 13th hole which plays to a slight dogleg left up over a waste area to a tricky green. Our day was rather windy which certainly increased the challenge there. Not surprisingly for a MacKenzie design there is definitely not a weak hole on the course. If Royal Adelaide wasn’t on the other side of the world I’d be a regular and if it was my local course it would certainly be the one I would have my heart set on joining. It’s more than worth a special trip to Adelaide if you ever have any invite to play. Royal Adelaide Golf Club was founded in 1892 and is one of the oldest golf clubs in Australia. One of the things you notice immediately at Royal Adelaide is the Grange-to-Adelaide train line. It runs through the middle of the course including right by the clubhouse and first hole. Although not originally designed by Alister MacKenzie, he was brought into make changes. MacKenzie’s major contribution was to re-route the course through the dunes on the central part of the property. MacKenzie's re-routing eliminated the back and forth across railroad tracks. Aside from the back tee on the fourteenth, all holes now play on either one side or the other. MacKenzie said, "If the suggestions put forward for the reconstruction of the Royal Adelaide course are acted upon, it will be superior to most, if not all, English championship courses." He wasn't far off. I played Royal Adelaide a couple of times as a member of another Adelaide club when RA had open day for Golf SA. It has some very good holes but I find it strange to have to avoid the railway line that remains in play (although really unplayable). The scrub areas (called waste areas in USA) are real hazards and should also be avoided as the long grass is tough to get out of. On the 2nd occasion we played in a strong northerly wind and my playing partner took 2 shots to overshoot the green on the 2nd which is a decent length par 5! I agree that the 1st is rather nondescript, but you start running into very good holes after that. When you arrive at the club, you quickly feel like you belong there. It’s palpable how the members are proud of their club and its history. With such a low-key nature to the club, I quickly felt at home and all visitors are made extraordinarily welcome. With a rich history of hosting the Australian amateur championship and Australian open championships, this Alister MacKenzie layout has a lot going for it. The novelty of having an active train line running through the course didn’t disappoint as the train shuffled its way through the course on a number of occasions during our round. If only the passengers on that train were aware of how historic that stretch of railroad ties were that meandered through the golf course. When Dr. MacKenzie visited the club during the Golden Age, he re-routed many of the holes to take advantage of the natural sand dunes, much to the delight of the golfing population. The short 3rd hole, barely 300 yards from the tips, is arguably amongst the short-list of greatest par 4s in the world without a bunker and is your first experience of playing through the dunes. The wise man will leave the driver in the bag. During the Open, the club grew the rough up along the dunes surrounding the green, which wreaks havoc with even the slightest of wayward tee shots. An honourable mention goes for the tee shot on number 4, the tee box was lowered and you play back through the dunes over a hill through a corridor of tall trees, with the landing area nowhere to be seen. It is quite a striking visual compared to the openness of so many other tee shots. On the front side, the 4th through the 6th are a very tough stretch of long par fours, especially the 6th hole, tipping out at 440 yards. With a wind in our faces, and a back pin, even the best of players would be proud to hit this green in regulation. Tom Doak has been working on a number of holes at Royal Adelaide over the past year. On the 6th hole, which mostly runs parallel to number 4, he joined a portion of the two fairways together so it’s one larger apron. Furthermore, there used to be a large bunker on the right side of number 6, which has now been filled in per consultation with Tom and his team. It was interesting to see old photographs of the 6th hole in the clubhouse to witness how it has evolved over time. In addition to number 3, the other signature hole on the front side is the spectacular par three 7th hole. The front of the green is surrounded by a ring of pot bunkers which is an impressive sight. The new blue tee is lower and back to the left of the old tee box, offering a new view of the hole over the sandy wasteland. It's an absolute joke that this course is rated so highly. Yes, it's a decent course, yes, it's a decent club, yes, it has a decent clubhouse. It is not, however, in the top 5, let alone top 10, golf courses in Australia. There are some quirky and interesting short holes, but there are also some extraordinarily bland streatches for a course ranked so highly (i.e. the first two holes). Good, but nothing more. Tough fast running course enclosed within highways and housing estates. Whilst there maybe a little noise the challenge soon absorbs your concentration. The 3rd is a special short par 4 with a tiny green wedged into a bank of thick rough. At the classic 14th you hit over the railway to a narrow fairway flanked by deep traps, a long iron or spoon is left to a tight raised green, gem of a hole.